Press the closed padlock for more than two seconds to close the windows automatically in addition to locking (according to version). Locking is confirmed by fixed lighting of the direction indicators for approximately two seconds. According to version, the door mirrors fold at the same time. When the vehicle is locked, if it is unlocked inadvertently, it will relock automatically after thirty seconds unless a door is opened. Press the closed padlock to lock the vehicle completely or press the closed padlock for more than two seconds to close the windows automatically in addition to locking (according to version). 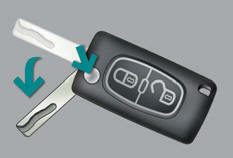 Turn the key to the right in the driver's door lock to lock the vehicle completely and hold it in this position for more than two seconds to close the windows automatically in addition to locking (according to version). Deadlocking is confirmed by fixed lighting of the direction indicators for approximately two seconds. This is indicated by lighting of the direction indicators for a few seconds.